Loyal Hana may be new to the game, having been founded in 2014, but the fashions that are coming out of this maternity/nursing brand are some of our favorites. Incredibly stylish and chic, yet reasonably priced, to make sure you have a fabulous wardrobe ready to go after the baby is born. We just got a handful of these items in! Pocketed Short Sleeve Shirt embodies soft, casual structure. With helpful deep side pockets. Flattering side seams conceal zippered openings. 100% polyester. Relaxed cap sleeve dress with concealed zippered opening. Sleeveless Dress with flattering front pleats and concealed zippered side-openings. Breezy silk-like drape ensures breathable comfort and easy fit. 100% polyester. 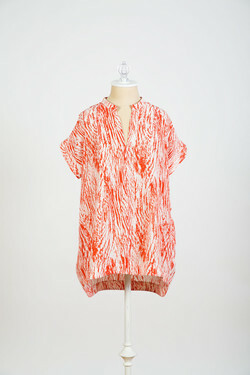 V-neck blouse with concealed zippered side-openings.